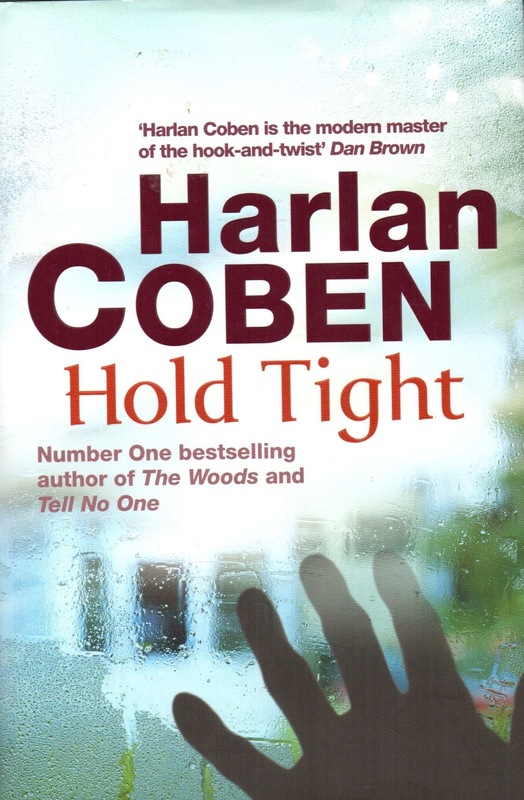 Harlan Coben’s thriller Hold Tight (2008) is up to his usual standard of convoluted mysteries that hold tight onto the reader, willing them to turn the pages. It isn’t great writing from a literary standpoint, but it is virtually unputdownable. Briefly, Tia and Mike Baye have two children, Jill, 11 and Adam, 16. They’re busy professionals. Then shortly after one of Adam’s friends, Spencer Hill commits suicide, their son Adam goes missing. These events may be connected. Their lives are unknowingly linked to several other characters as the events unfold. There’s Nash, a psychologically damaged widower and his zombie-like helper, Pietra. Nash wants something badly and is willing to inflict pain and ultimately a gory death on those who obstruct him. Chief Investigator Loren Muse has to combat a resentful subordinate and solve the death of a woman whose face has been battered beyond recognition. Betsy and Ron Hill are reeling from the suicide of their son, and they’re growing apart, unable to offer comfort or answers. Susan and Dante Loriman are neighbours of the Baye family; their son is dying but could be saved if the correct blood-type person can be found. Over a few days we get to know all these people, their troubles and their broken dreams. Cleverly, Coben slowly establishes links. Even at the end, when a bloody resolution is disclosed, there is one final little twist to reveal. Of course the Bayes wanted to hold tight to their children, yet they must grow up and eventually make their own way. How to do it was the problem. Freedom with safety. Not possible. A number of moral dilemmas are presented. Definitely one of those books you won’t want to put down until you’ve finished it. A satisfying thriller. A continuity glitch occurred. On p24 ‘In the corridor Tia stopped and took out her mobile phone.’ Fine, but then she didn’t do anything with it. And on the next page , she ‘took out her cell phone and put in…’ Intrigued how the cell phone became a mobile phone; as if an English editor put that in. On p54 ‘she could barely get the mouse on the image.’ Here, it should be the cursor, not the mouse. 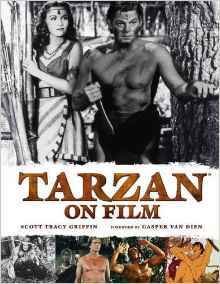 Scott Tracy Griffin’s follow-up to his successful coffee-table tome Tarzan: The Centennial Celebration (2012) is Tarzan on Film (2016), a 224 page (10"x13") generously illustrated, fact-packed appraisal of the 52 Tarzan movies and telefilms and seven TV series. It begins with a foreword by Casper Van Dien, the twentieth actor to portray Tarzan, offering a few anecdotes from his filming of Tarzan and the Lost City. Throughout, there are many other fascinating insights and anecdotes concerning the actors, actresses and directors. The book is a feast for Tarzan fans and for anyone fascinated by the movie business. The Tarzan franchise was the most profitable in history until the James Bond movies took off in the 1970s. The only other fictional character to have been a serious contender for the number of movie and TV adaptations is Sherlock Holmes. Edgar Rice Burroughs’ first Tarzan story was published in 1912 in magazine format and subsequently as a novel. Twenty-three novels followed. It was inevitable that this iconic character would find himself on the silver screen. In 1918 the silent movie appeared, Tarzan the Ape Man, starring Elmo Lincoln. As we know, Hollywood didn’t really buy into the complete ape-man, only aspects of him. Until relatively recently, he was presented as a grunting, monosyllabic strong yet simple man, while in the books he possessed a remarkable inherited intellect, teaching himself to read and speak several languages, including French, English, German, Arabic, Dutch and a host of African dialects. 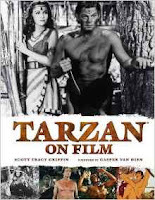 The first talky Tarzan film was Tarzan the Ape Man (1932), starring former Olympic swimmer Johnny Weissmuller; he appeared in twelve Tarzan movies and is still fondly regarded by fans. The scripts required the ape-man to appear a noble savage capable of only speaking broken English. One exception was the Burroughs co-produced The New Adventures of Tarzan (1935), starring Herman Brix (also known as Bruce Bennett). The “me Tarzan, you Jane” characterization persisted until the late 1950s, when producer Sy Weintraub produced Tarzan's Greatest Adventure (1959) featuring Gordon Scott. It must have been strange for Scott to present an ‘educated’ ape-man having already starred in four ‘monosyllabic’ Tarzan films. The Weintraub productions portray a Tarzan that is closer to Edgar Rice Burroughs' original concept in the novels; subsequent outings have maintained that stance with Ron Ely et al. There are interesting biographies of the actors and actresses who played Tarzan and Jane over the years, and others besides. Despite the scripts, the stories and actors brought in the audiences in their droves. Each actor added something to the myth. Take, for example, Jock Mahoney, ex-stunt-man and TV’s Range Rider, who was the oldest actor at 42 to accept the legendary loin-cloth. He was suggested to replace Weissmuller and Lex Barker but didn’t take the role until 1960, superseding Scott. ‘Mahoney added 20lbs of muscle to his 6’4 frame, expanding his chest to 50” atop a 31” waist, while maintaining his lean corded appearance at 215lbs.’ It was just as well that he was fit. While filming Tarzan’s Three Challenges (1963) he was required to swim in the Klong River in Thailand. The river was polluted with human waste and rubbish. He swallowed the water and suffered dysentery, dengue fever and pneumonia, his weight plunging to 175lbs, finishing the film quite gaunt. The show must go on, indeed: ‘Following the final sequence, the delirious Mahoney, who was fainting several times a day, was rushed back to the hotel where co-star Woody Strode put him in an ice bath and fed him antibiotics like candy.’ Strode said that anybody but Jock Mahoney would have died. He took two years to recover his health and went back to work (sans loin-cloth). Also covered are the two 2016 movies The Legend of Tarzan and the animated Netflix series Tarzan and Jane. Besides the many still photographs, there are numerous film posters; indeed, some of the older ones are frankly poorly illustrated, but of their time. Even after almost a hundred years, the movie Tarzan is still a phenomenon and this book does the franchise justice. A collector’s item, to be sure. Throughout Spain on 6 January there are parades for the Three Kings (Balthasar of Arabia, Melchior of Persia, and Gaspar of India). This year was no exception for the main local town of Torrevieja. The three kings traditionally hand out sweets to the children. The previous day, the three kings visited the children’s ward of the hospital and handed out presents. This year, however, across Spain there was extra police presence. At 6:30pm the Torrevieja police were informed of the theft of a Nissan lorry with an old number plate registered outside the area; it was stolen 2km from the town centre where the parade was held. In rapid response, both the Guardia Civil and the local police positioned patrol vehicles at strategic intersections that accessed the town centre. Often, we’ve seen Guardia Civil with caltrops and machine pistols by the roadside, as if waiting for some miscreant. Drug smugglers are caught regularly. As are suspected terrorists. The lorry was later found burned out on the outskirts of the town. At some point the lorry had swerved off the road, driven into a gully and hit the perimeter wall of an urbanisation. A few witnesses saw the accident at 2am; two young people left the vehicle and ran off after setting fire to the cab. It’s highly likely that the lorry was stolen by joy-riders – who could have still caused injury or death. It’s heartening to realise that the forces of law here are organised and ready for action, and willing to think the unthinkable. Here, at least, lessons seem to have been learned from the atrocities of Nice and Berlin. For many years the appendix has been considered a useless organ, a hangover from our evolution; believed at one time it might have had a function, but is now vestigial. Yet according to a report published by a researcher of the Midwestern University in Arizona it is suggested that when the gut is affected by unwelcome bacteria the appendix can help good bacteria to grow and recolonize the digestive system. 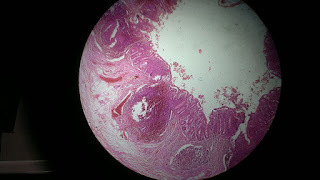 It seems the appendix has a higher concentration of lymphoid tissue, which is vital to the immune system. So, it isn't useless, after all. In the middle of last century there was a minor trend to whip out the appendix for the slightest excuse; the same applied to tonsils and adenoids. Over-zealous surgeons preempted any risk of appendicitis, since that had the potential to cause fatal infection. Set shortly after the American Civil War, historical western novel Fire Canoe Finnegan (2015, paperback, 249pp) by Denis J Harrington and Charlie Steel offers an enjoyable read for fans of the period and readers in general. ‘Fire Canoe’ is the term attributed by the Indians to the riverboats that brought countless white men to their territory. Young Clint Finnegan is seeking adventure and a new life and is hired by Captain Glazer of the riverboat Dakota Dawn. His role is to be assistant master. Glazer paints a troublesome picture for Finnegan: ‘Gales, thunderstorms and tornadoes coming off the land will sink a steamboat faster than you can blink.’ (p21) Then there are winter’s ice floes and summer’s migrating buffalo, Indians and river bandits to contend with. ‘This isn’t a business for the faint of heart.’ Despite the sad fate of previous assistant masters, Finnegan accepts the offer! Clint Finnegan is a likeable character who stands up for what’s right, no matter what. We’re introduced to the workings of the Missouri River steamboat and several crew members, some of an unsavoury nature. Finnegan speedily learns to handle all the chores required of him. But it wasn’t going to be plain sailing, especially since a number of Army officers are escorting a payroll strongbox. Before long, Finnegan meets attractive Elisha Parkinson, who is on her way to join her widowed father at his fort up-river. As events escalate, the action is removed from the river to the land of the Sioux as Finnegan, aided by an Army scout, attempts to rescue the kidnapped Miss Elisha and recover the stolen money. Resourceful and brave, Finnegan encounters Colonel Parkinson, a firm fair soldier who commands the respect of his men, Liver Eating Abner Mosely, a scourge of the Sioux, and Hump, the Miniconjou Sioux warrior hankering after killing a few interloping white men. All are well-drawn characters, including the kidnappers and thieves. The scene is set for a fiery and bloody confrontation, and the pace of the narrative quickens as we race towards the satisfying denouement. Throughout, the description puts us in the scene and the action. 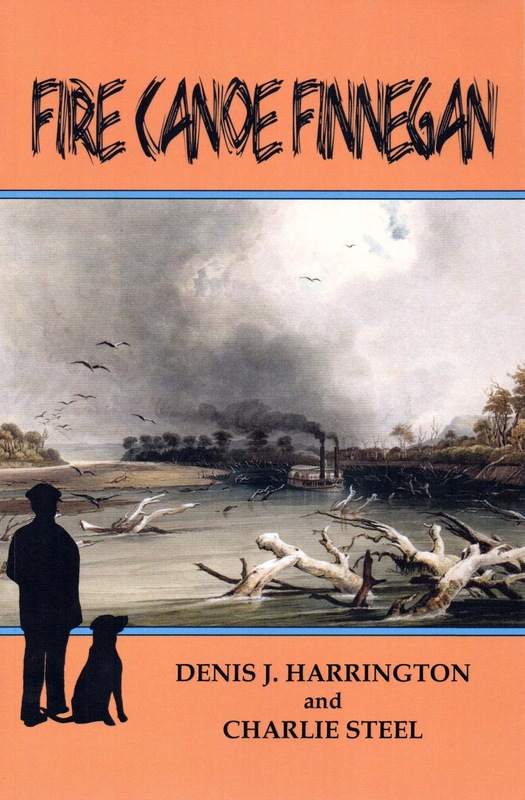 The silhouettes on the cover depict Finnegan and his faithful dog, Duke. I for one wouldn’t mind meeting Finnegan again. Sadly, co-author Denis Harrington died July, 2015. Editorial comment: For third person narrative, it’s preferable to consistently use only one name, either the given name or surname, not interchangeably both – either Clint or Finnegan. Obviously, relating characters will have a preference of one or the other, as appropriate.